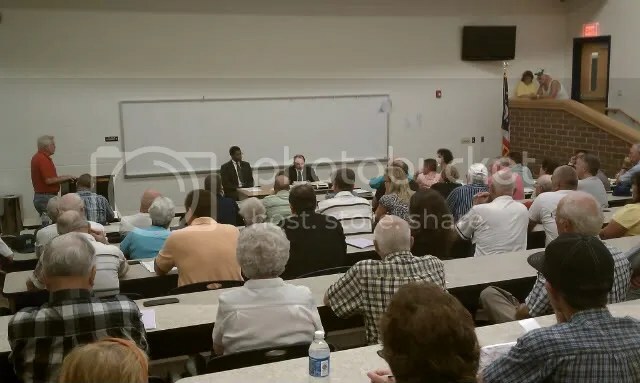 On July 8, 2010, approximately 120 attended a public hearing for Heartland Wind Energy project in rural Van Wert County. This was a legal hearing, and anyone wishing to give testimony had to raise their right hand and swear that the testimony given will be the truth. Prior to giving testimony, individuals also had to state whether there residence is or is not in the project area. According to Iberdrola Renewables, the company financing this wind project, the project in Van Wert and Paulding County has a scope of 159 wind turbines, which will provide about 80,000 houses with electricity. Heartland Wind, LLC is proposing to construct, own and operate up to 350 MW of wind-powered electric generation in Van Wert and Paulding counties. Heartland Wind, LLC is managed by Iberdrola renewable, Inc. The facility would require up to 175 wind turbine generators that would be located within a 40,500-acre project area. Approximately 140 participating landowners would provide about 17,000 acres of leased land. The application was filed on December 21, 2009. Random fact: In Ohio, the wind turbine must be a minimum 750 feet from horizontal extended blade tip to nearest residence. Testimony was polarized, and fell into two categories. The numbers I present below aren’t official; they may or may not be accurate (they should be fairly close, though). The bullet points below are recorded as I recall from the given testimony. Entry filed under: alternative energy, environment, sustainable, technology. Tags: heartland wind energy, iberdrola, wind energy, wind farms, wind lease contracts, wind public hearing, wind turbines.